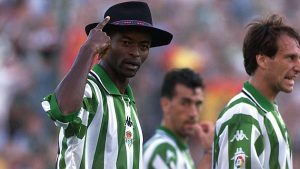 Former Super Eagles winger Finidi George turns 48 years old yesterday and Federation of International Football Federation, Nigeria Football Federation and his former Club Real Betis has taken the opportunity to celebrate the retired winger. Spanish LaLiga also wasn’t left out in celebrating the former Ajax Amsterdam player. “A @NGSuperEagles #WorldCup legend! That celebration, though Happy birthday to the one and only Finidi George! ,” reads a tweet on FIFA’s Twitter handle with a video of his famous goal and celebration in Super Eagles 2-0 win against Greece at the 1994 World Cup in the United States of America. “Today marks the mythical shadow of play for 48 years! Happy birthday, Finidi! ,” Real Betis Tweeted on their official Twitter handle. 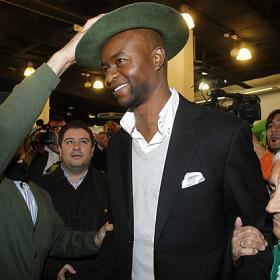 Happy 48, Finidi! ,” reads a tweet on LaLiga Twitter handle. Finidi made 62 appearances for Nigeria Nigeria and scored six times. He won the 1994 Africa Cup of Nations with the Super Eagles in Tunisia and featured at USA 94 World Cup and France 98. He also won the UEFA Champions League with Dutch side Ajax Amsterdam in 1995.